It’s a bit foggy in Chester, PA— and this isn’t a reference to the weather. 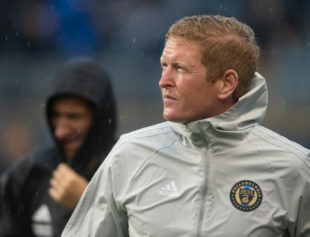 International duties and injury concerns have left Philadelphia Union head coach Jim Curtin with a shortage of options ahead of Saturday’s contest with Columbus Crew SC. Further complicating the situation is the status of recently acquired midfielder Jamiro Monteiro, who has yet to gain eligibility to play for the Union. Generally, Curtin’s weekly press conferences provide a bit clarity for the collection of reporters assembled at Talen Energy Stadium. Today’s gathering answered some questions, but with the coach’s responses came additional queries. So let’s start with the “man” of the hour. The question of whether Aaronson had done enough to remain in the starting lineup didn’t need to be asked. The barrier to Aaronson lining up in the same position that he found such success in Atlanta playing is the club’s most notable signing in franchise history. Designated Player and Mexican international Marco Fabián wasn’t acquired to sit on the bench. Curtin, though, offered a solution many had suggestion. It’s phrased in a manner which seems to allow for, while unlikely, the possibility that Fabián could still face an additional suspension from MLS related to the red card he received against Sporting Kansas City. Playing Fabián off of forward Fafa Picault creatively addresses the hole in the Union’s lineup this weekend. Forward Cory Burke, who started the first three games, is away with the Jamaican national team. His potential replacements Sergio Santos and Kacper Przybylko are both out with injuries. The possibility this happening or of Aaronson playing as the No. 8 opposite of Alejandro Bedoya likely depends on an even more complex situation. “To be clear on [Monteiro]— he’s not 100% cleared yet, but we’re confident that it will be sorted out come kickoff,” Curtin revealed. “So that is another international spot. The complication stems from that aforementioned international roster spot. Currently, the Union have all such slots occupied. This was meant to be alleviated by two players receiving green cards, one of whom was believed to be Burke. If Philadelphia are able to ensure Monteiro’s availability, Curtin’s opinion of the player all but guarantees a starting spot. With all the moving parts, the team did secure stability along their back line. It was surprising not to see young center backs Auston Trusty and Mark Mckenzie among the players listed for the U.S. U-23 and U-20 national teams. But it wasn’t because either player didn’t belong. The manager went on to mention the importance of friendlies vs. league play. It’ll be interesting to see what decision is made if Trusty is selected for the Olympic qualification tilts. For McKenzie, it was unclear if U-20 coach Tab Ramos was as understanding having previously expressed frustration with teams failing to release players. I heard that they’re going to solve the international roster spot problem by lending Fabinho to Sun Rocket FC. apparently there is an expansion clause. I would buy that t-shirt jersey in a heartbeat. It is without question one of PSP’s best reoccurring jokes. Filing “Sun Rocket FC” jersey away on our list of PSP merch ideas. i started designing a logo but it looked very phallic with some suggestive “sun rays.” i decided concept needs a little more thought. The club before country complex is a ……complex one. While I understand if friendlies are the reason… qualifying is something altogether different- especially during a time of upheaval and fresh starts and the ripening of MLS Academy players to raise the level of the game domestically and by extension internationally as a means of showcasing ‘our’ talent. If I’m MM or AT and I can’t go represent my country I’m fairly annoyed. Especially if I’m MM currently sitting behind JE on the bench. Trusty makes sense. I’m curious about this for McKenzie, though. Jones was allowed to leave and has actually played this season. Collin can fill in as the emergency option. My guess is that with all of his injuries, the Union want McKenzie to settle back into a normal flow and try to win his job back. With all racers awake, please, that I am just guessing with no hidden knowledge, … . McKenzie might be getting some game minutes Sunday night if he is not needed for some emergency Saturday night. It would Minutes on a pitch in a game, albeit not quite MLS intensity or pace. My understanding is that the Union can’t loan either Santos (injury) or Burke (int’l duty) to the Steel for purposes of roster compliance. Bedoya claims via social media that Fabian can’t play Sat. That’s insane. It shouldn’t have even been a red card let alone a 2 game suspension. What is wrong with MLS.